Discussion in 'SSD and HDD storage' started by Hilbert Hagedoorn, Jan 19, 2010. I'm skeptical about NCQ, I like to have it disabled and what I've seen (Please DO correct me if I'm being a total noob) is that with AHCI mode there is no way to disable NCQ. 2x separate Hitachi HDT725032VLA360 320GB SATA : One is C: with Win 7, the other D: with paging file and some temporary download. 1x Corsair CMFSSD-128GBG2D : I gave it the letter S:, it has games installed. 1x Samsung HD103UJ 1TB : This is F: for backup/storage and various file purposes. And I get a better performance as with the write-cache buffer flushing enabled. Now, everyone says that SSD should go together with AHCI mode, but still I hate to see performance taken away by NCQ, in my case useless and counterproductive. Any take on this one ? Seems it's most effective when traditional drives or very high end SSD's with the feature implemented. Not sure mine supportst his. It's the X25-M. I believe teh X25-E does however. Wouldn't this only come in handy if the CPU reaches full load and is unable to send commands to the SDD? The following site seems to disagree that AHCI is always better (especially with SSDs). Regardless, I've always use AHCI mode cause I like to think I have the "hotness".. but may try IDE again if/when I get an SSD. Did you notice that this benchmark test is nearly 10 years old? do you realize that this benchmark test is nearly 10 years old? eh.. about 5 (should have left the maxtor off).. oh well. the first link is still good. I've never had problems with them working (and install with ahci/ncq enabled) but found it interesting that IDE mode seemed to deliver better performance in many cases when used with an SSD. I'll make my own comparisons eventually, maybe once vertex 2 comes out. I have read the same article. they said they got an extra 20+ MBPS with sata VS ACHI. Personally i have not benchmarked both ways, but have it set to ACHI. So whats the verdict with it on HDDs, put Win 7 on my sisters laptop yesterday did a clean install going from vista. And her bios had it set to ahci, even though it said the recommended setting is ata (or ide), seems weird that they set it against their recommended default. I just left it on ahci in the end) Win 7 works fine anyway. On my ICH9M with eSATA, also Intel Matrix Storage Console package had to be installed to enable AHCI mode because it contains the driver. I tested it (changing from IDE to AHCI) on my WD Velociraptor 300GB 10.000RPM and on that HDD the performance drops are huge . Min becomes 2MB/sec(AHCI) instead of 50.7MB/sec(IDE) , Max is the same 120MB/sec , Average is 85MB/sec(AHCI) instead of 96MB/sec(IDE). Test on Samsung HD 103UJ 1000GB the performance is almost the same but still a performance win in IDE mode , about 10MB/sec in min , max and average transfer rate. So on my motherboard and HDD's it's better to leave it at IDE. Which AHCI driver are you using? When I enabled ACHI, my SATA channels becomes available (more slots..). Because from what I understand, IDE restricts 4 SATA channels. No wonder why my HP DVD RW didn't show up in windows until I enabled ACHI, then windows were able to identified rest of the hardware install on SATA channel 5 or above (1-4 already been taken). However, it suffers performance drops on a large margin, so I am not sure if there's an updated driver from AMD? I have AMD 790GX. Download one from their official website maybe? Guys i want to enable AHCI, but whenever i do windows never loads. It goes to the loading screen with the colorful windows logo and just sits there. I have to force restart. Safe mode has the same issue, it goes to the drivers loading screen and when it gets to the bottom it stops loading. Same thing happens with windows recovery console AND when i try to install a fresh windows. I looked at what hilbert said and it was already set like that. There are three settings and i will try to get a pic of what it looks like. Can you change OnChip SATA Type to AHCI? Because now AHCI is on only for eSATA and additional controller on your mobo (probably jMicron). 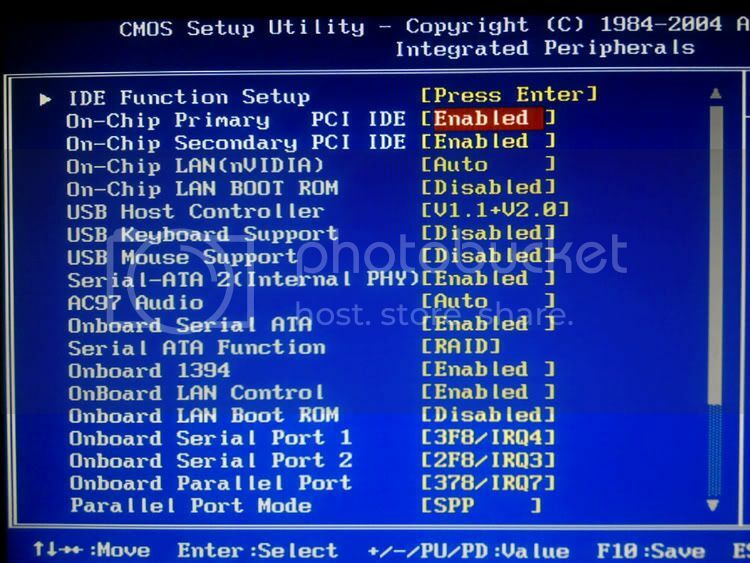 If your system drive is connected to Intel Controller (ports 0-3 or 0-5) then set AHCI only for those (before that use the tweak from 1st post). If you have any devices connected to eSATA and/or jMicron Controller (it's called GSATA on Gigabyte motherboards) then disconnect them, run Windows, uninstall drivers for them, go to BIOS, change to AHCI and install AHCI drivers when in Windows. For GSATA drivers (jMicron) do and download the newest one from ftp://driver.jmicron.com.tw/ (probably jmb36x chip, a least I had this chip on my Gigabyte mobo - take eSATA version) as Gigabyte drivers are very old. On my personal system I use AHCI for hot-swapping with Marvell chipset - it's very good feature with Welland ME-751 Tray-less HDD Bay - you can slide HDD in/out without the need of any other tray/enclosures to be mounted to it. I have also read that if you have RAID on your motherboard, you should always enable it, even if you don't use RAID 0-1-5-10 or other volumes. HDD in RAID mode can work as a single drive, not being part of any RAID volume. When you enable RAID mode, you have AHCI within it enabled as default. So you have all that AHCI has to offer plus all the advanced options that RAID controlling software can give you. not what i was expecting, but my main concern here is switching from IDE to AHCI. ive done the whole HKEY_LOCAL_MACHINE\System\CurrentControlSet\Services\Msahci to 0 bit, but when i go into my BIOS, this is what i see. where do i change it to AHCI??? is it possible that my Gigabyte K8 Triton board doesnt have the AHCI ability? if not, is there a certain spot my X-25 should be plugged into? any direct help or relevant linking would be greatly appreciated as i have been out of the PC modding loop lately. my rig is old, but ive just recently upgraded the storage (1. X-25M 2. Black Caviar 3: 1TB WD external) and plan on doing the case/cooling next, then mobo/proc/ram/video last. i rarely game now, so keeping everything top of the line really isnt that big of a priority anymore. plus, the idea of dumping a lump sum of cash on a new rig and skimping on the less important parts bc of budget isnt very appealing to me.